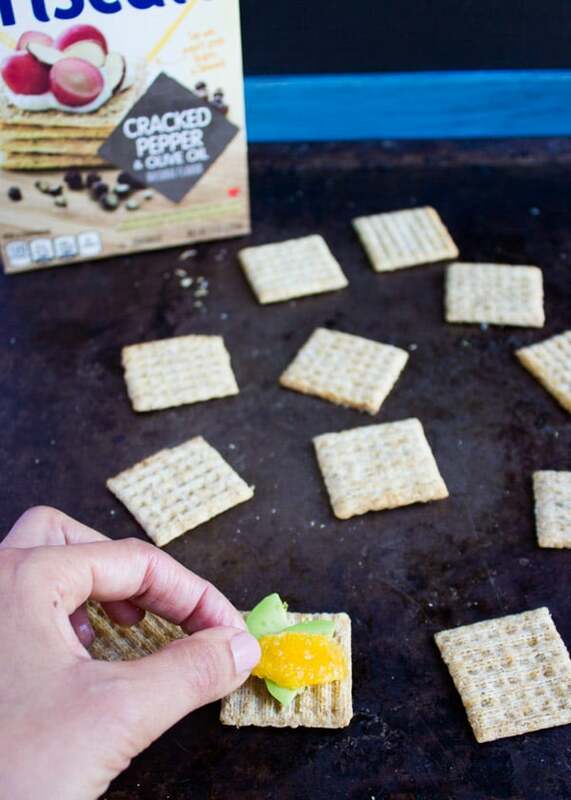 Here’s an appetizer you’ll be making more often than you think—the Orcadomintscuit! So what exactly is it? 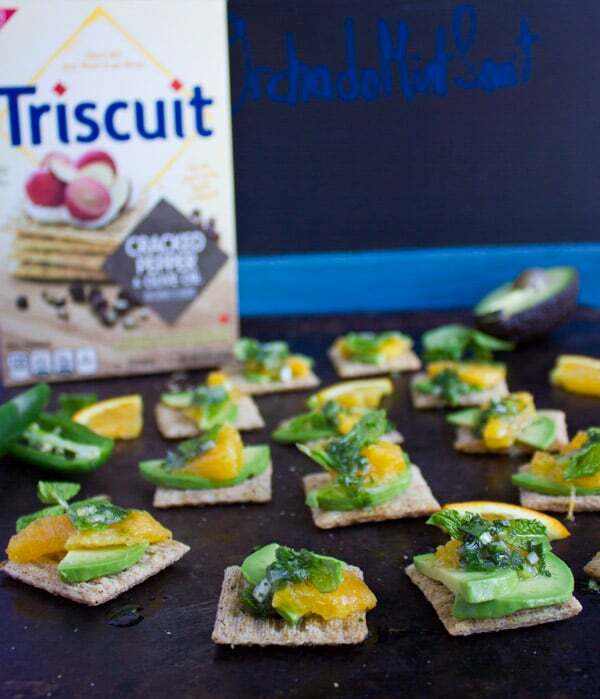 It’s a combo of orange, avocado and mint on your favorite TRISCUIT crackers! Drizzle that with a spicy jalapeno, lime, cilantro and sweet honey sauce and you’ve got yourself an absolute treat! While this recipe seems simple and obvious—which it really is, it’s also absolutely totally extremely delicious at the same 🙂 There’s something about it that will make you reach for more. I know you’re wondering how? it sounds too simple, too easy and familiar. And maybe that’s part of the charm. But that’s not all, there’s more to the orcadomintscuit than that, so trust me on this one, it’s really GOOD!! 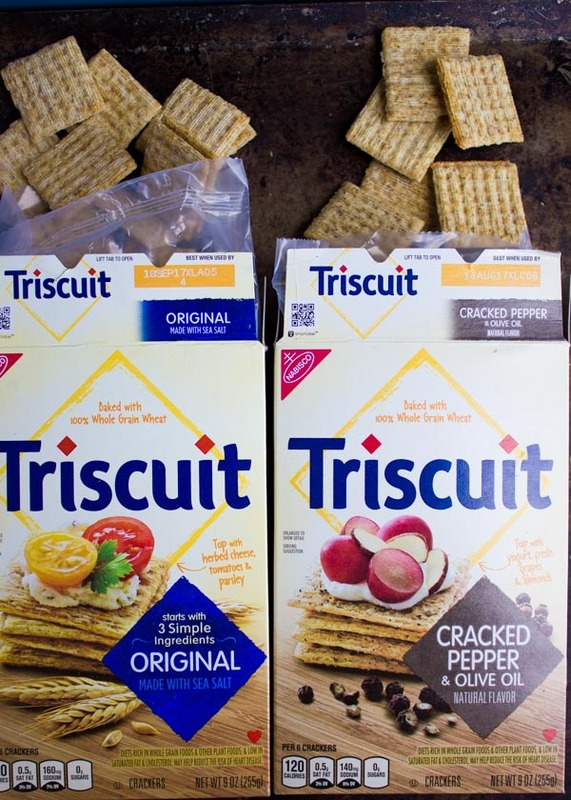 It starts with one of the best crackers out there, the TRISCUIT crackers! 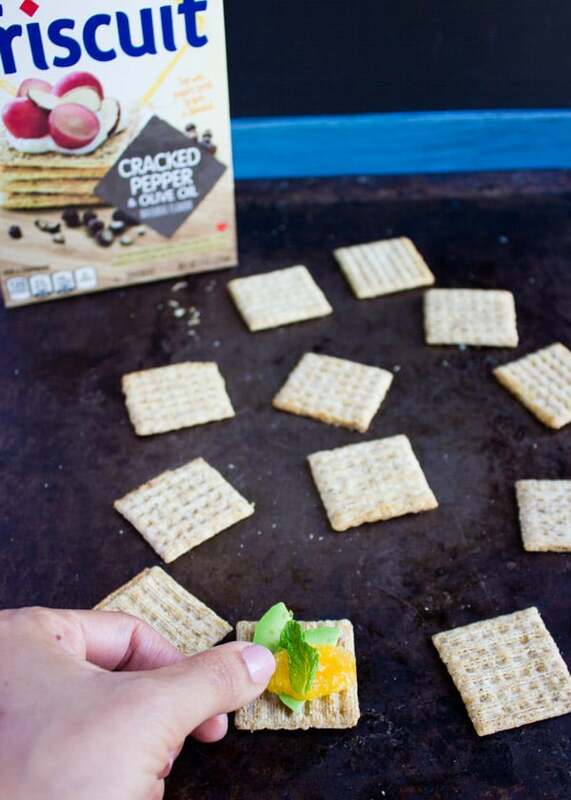 They’re actually not your average crackers, they’re a staple at my home which I use endlessly. I can almost pile up any toppings on them, dollop any sauces or salsa, and sprinkle any extra flavors like herbs or spice or cheeses and I’ve got myself a different appetizer/snack every time. While I’ve used the simple TRISCUIT Cracked Pepper & Olive Oil today, you can try one of the many many amazing TRISCUIT flavors out there. 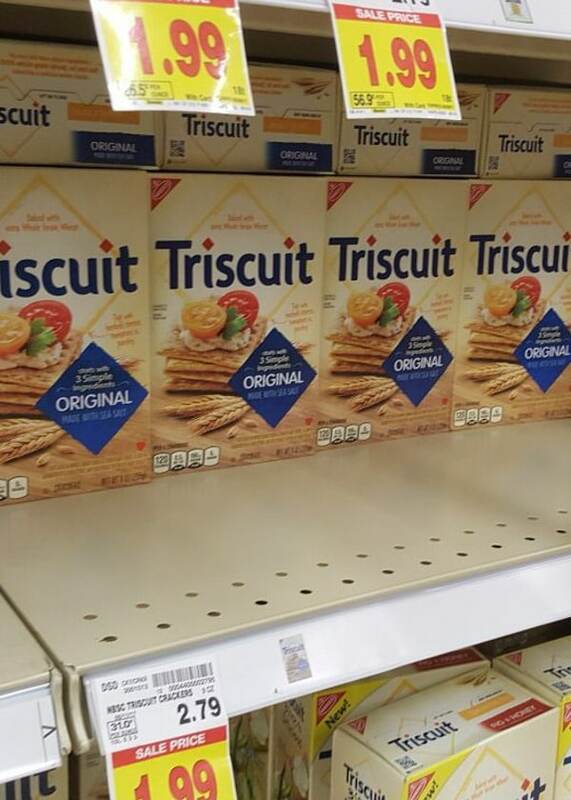 I went to my local Kroger store to buy the TRISCUIT crackers—which I only discovered when my family moved to MI. Back in Miami, we had no Kroger stores and we were really missing out! 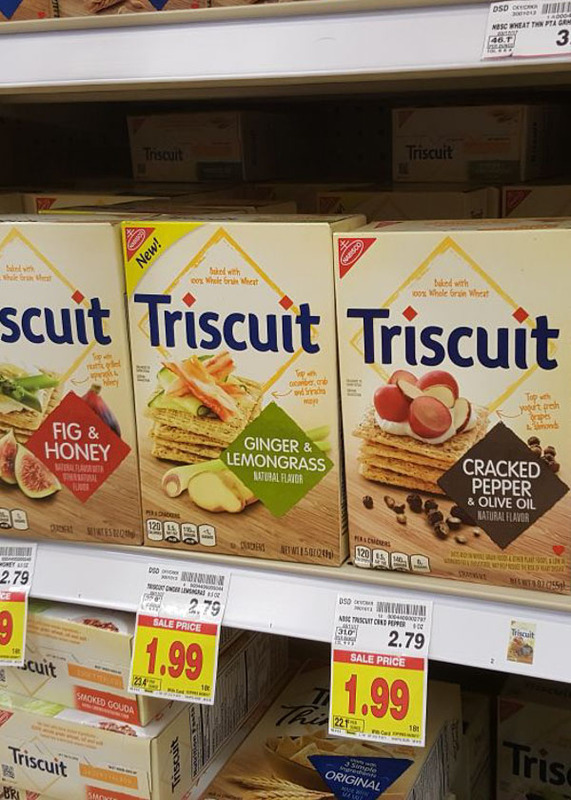 Here’s a Kroger/Kroger Family store locator so you can find yourself some amazing TRISCUIT crackers! I also love their huge organic section, so basically when you pick up your crackers you can pick up the freshest oranges, avocados and mint to make the orcadomintscuit! 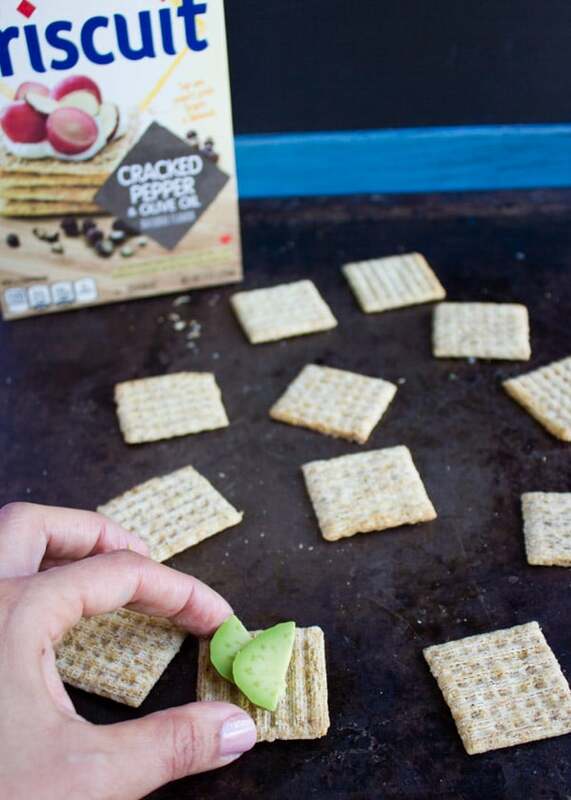 Now here’s how you assemble this simple, fresh and tasty appetizer. First of all chose your favorite TRISCUIT cracker ( I chose the TRISCUIT Cracked Pepper & Olive Oil today). 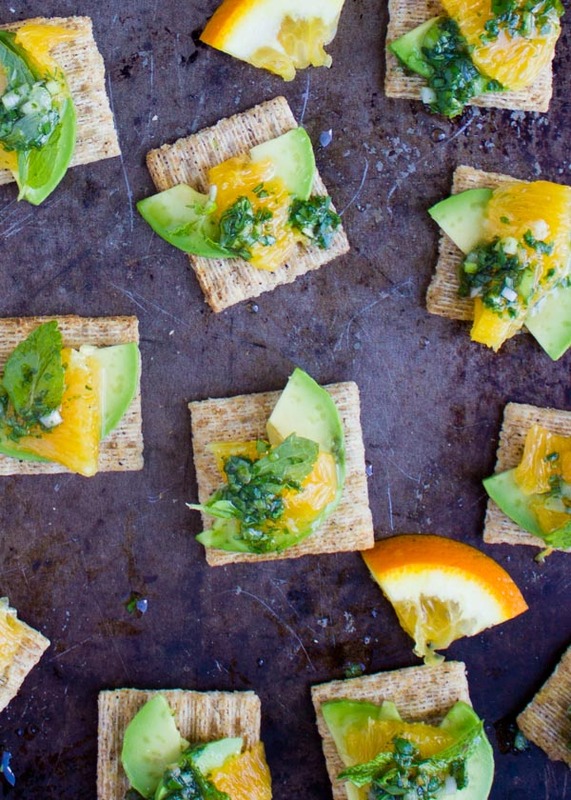 Add a slice of avocado, a slice of orange segment and a sprig of mint. Now you’ve got yourself the basic orcadomintscuit. 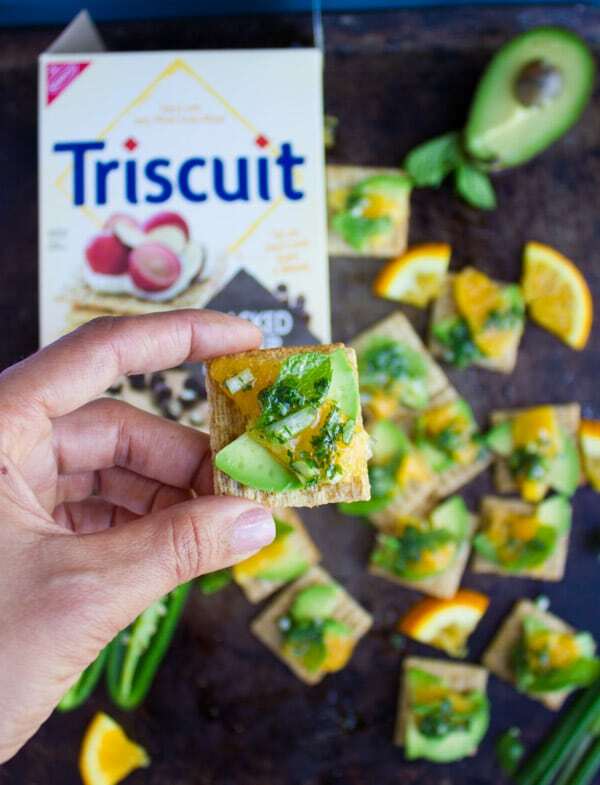 Delicious as it is with the crunch from the TRISCUIT crackers, the black pepper flavor, the smooth buttery avocado, the sweet juicy orange and a burst of freshness from the fresh mint. I love to drizzle that with a mixture of minced jalapenos, cilantro leaves, lime juice, olive oil and honey. 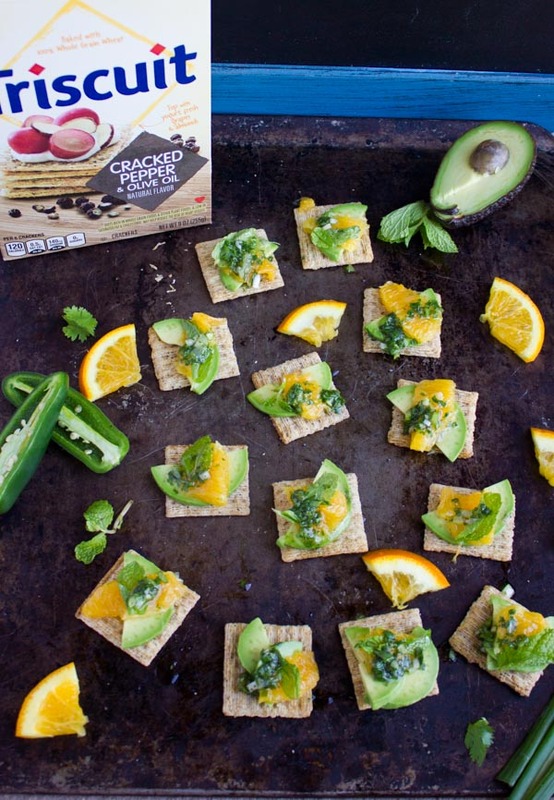 The spice perfectly compliments the sweetness from the orange, the cilantro and lime burst more freshness into the orcadomintscuit while the touch of honey just balances out all the flavors beautifully! It’s a mixture of flavors, textures and best of all it’s the easiest way to put together a crowd pleasing appetizer. 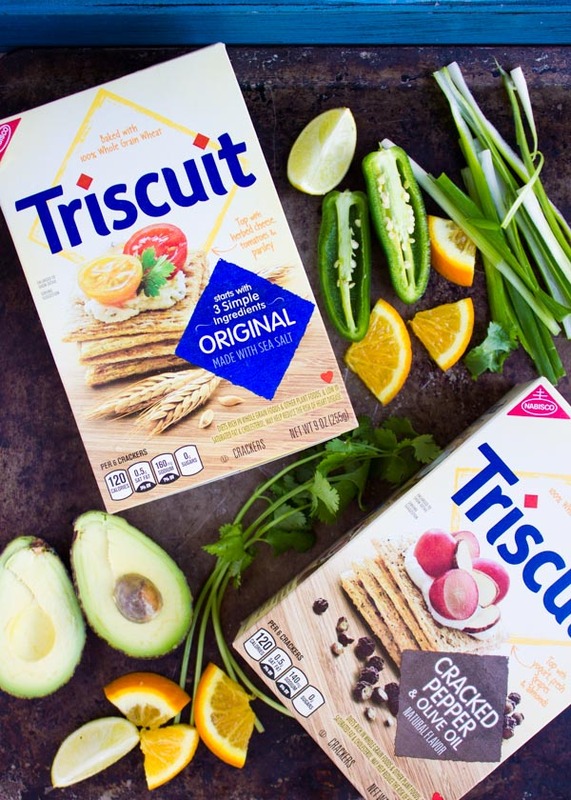 The freshest simplest ingredients are always the best 🙂 TRISCUIT Crackers are made with simple ingredients and offer a great source of dietary fiber, and they’re great for snacking and entertaining. So grab a few flavors, try them with your favorite toppings, a slice, a dollop, a sprinkle and Make ‘Scuit Happen! They’re delicious any way! 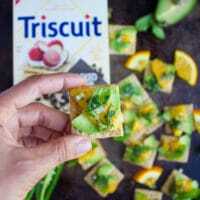 🙂 And here’s a source for great TRISCUIT recipes and inspiration. Finally, you need to try the orcadomintscuit recipe! You’ll totally enjoy it! Blend all ingredients together in a mini food processor until smooth or finely mine and mash the dressing in a bowl. 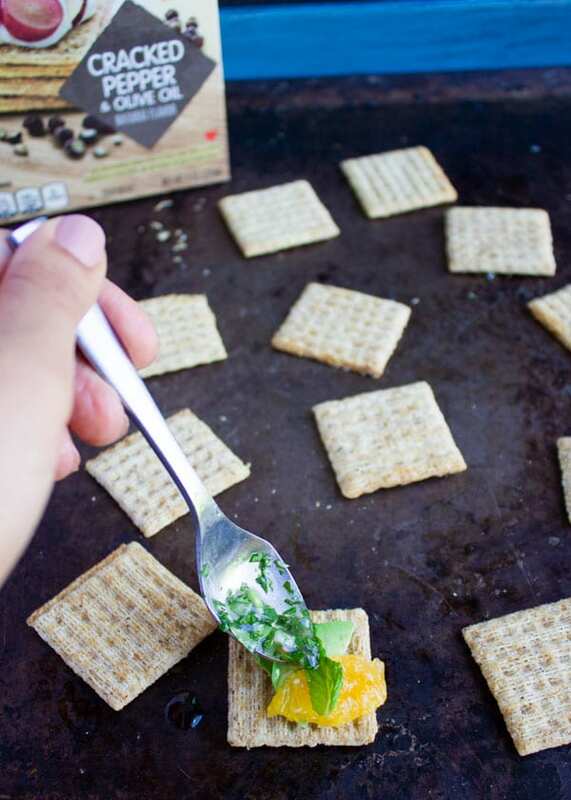 If your fresh mint is flowering, sprinkle topped crackers with some mint flowers in addition to the mint sprigs. Hi Gwen, the dressing ingredients are mentioned in the recipe and I mention in the write up to blend it all together 🙂 I will update that right away! Thanks !